Is this limestone cavern an entrance to Xibalba? In Mayan lore, Xibalba was a frightening place, a kingdom of the dead entered through caves. During a recent adventure to Belize a group of students and Bug of the Week visited Xibalba to discover strange creatures beneath the earth. After entering a cavern and navigating a stygian river, we landed on a stony beach deep underground. Amidst stalagmites on a limestone wall rested a spider-like arthropod with gangly outspread legs. This member of the arachnid clan was not a spider, but a fascinating creature known as a whip spider a.k.a tail-less whip scorpion or amblypygid. With legs outstretched a whip spider waits high on a cavern's wall. These denizens of the dark are often found underground in caves or deep in the tropical forest were they hide beneath rocks or in tree holes by day and ambush prey by night. While other arachnids such as spiders and true scorpions amble about on four pairs of legs, whip spiders use just three pairs for nocturnal strolls. The fourth pair found toward the front of the creature is extraordinarily long and loaded with sensory structures to detect odors and objects including mates, offspring, and prey. These so called “whips” can be three to six times the length of the body and give the whip spider its common name. Whips move in almost a complete circle around the beast and are very useful for detecting objects ahead, behind, above, and to the sides in a world of darkness. Just in front of the whip-like legs is a pair of scary hinged appendages known as pedipalps. This “sit and wait” predator uses pedipalps to capture prey in much the same fashion as a mantid uses its forelegs. As the victim enters range, a rapid strike of the pedipalps ensnares the prey in comb-like teeth. Usual meals include crickets and moths, but small lizards are known to be eaten by these clever predators. Once captured the victim is pulverized by two grinding jaws called chelicerae. Digestive enzymes are added to the pulpy mass and the whip spider ingests the liquefied meal. As frightening as whip spiders appear, they are truly harmless to humans. In fact some species have several endearing behaviors. Mother whip spiders typically carry their young on their backs for several weeks after offspring hatch from eggs. In captivity, females of the Floridian whip spider, Phrynus marginemaculatus, continue to interact with their offspring for several months after the babes have departed from their mother’s back. Mothers were observed to move between small clusters of young ones. Females and offspring frequently engaged in gentle mutual stroking with their whip-like legs. How often these fascinating behaviors happen in the wild remains to be seen. The message conveyed by the mutual stroking is known only to the whip spider and her young, but in Xibalba a gentle touch from mom could be a comforting signal even to a whip spider. Bug of the Week gives special thanks to Israel and Clarence our intrepid guides that brought us safely into and out of Xibalba. We also thank David Minor and Damon Yeh for providing photographs of whip spiders used in this episode. Peter Weygoldt’s fascinating text “Whip Spiders” and the wonderful article “Social behavior in Amblypygids, and a reassessment of arachnid social patterns” by Linda Rayor and Lisa Anne Taylor were used as references for this episode. 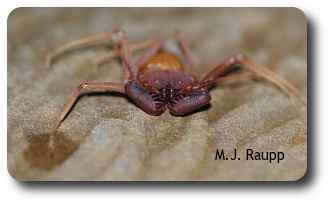 To learn more about whip spiders, please visit the following web site.